I will never forget the morning of December 16. My husband woke up around 5:00am and discovered that Dahlia had vomited. No big deal, probably something she ate. He ran down to get some stuff to clean it up and I went to check on Dahlia. And that was when I discovered her condition. She couldn’t stand. She tried to, but her back legs wouldn’t get underneath her and she kept falling over. Her head was moving strangely, like she was following something darting around the room. I remember calling to my husband, shouting that there was something seriously wrong with Dahlia. I kept trying to get her up and she finally just lay there, head bopping around in the half light of our bedroom, not moving while I panicked. It was a stroke. I was absolutely sure of it. My husband carried her downstairs. She was dead weight in his arms. He doesn’t even remember the trip downstairs or out to the car. He barely remembers the drive to the emergency vet. But I do. I remember feeling both panicked and numb at the same time (how is such a thing even possible?). I remember being sure that we were losing our best girl, that the end of the road had come far too early (at only about 9 1/2) and far too quickly (she had been running around the yard playing hard with Ben just the night before). When we pulled up to the vet, I was sure we were about to get terrible news. They whisked her away from us to check her out before we had much of a chance to even think and we were taken to one of the rooms to wait for her return and the vet with her. I don’t know how long we waited. It wasn’t very long, that much I do remember. The techs brought Dahlia in to us and laid her on a blanket. We both sat on the ground with her. I wanted to cry. The vet came in shortly thereafter. But we weren’t. And that was what the vet was there to tell us. 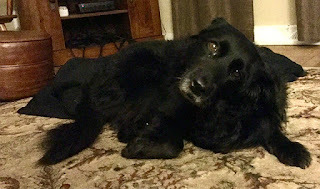 As it turned out, Dahlia had something called Idiopathic Vestibular Disease (or IVD for short). Sometimes called “Old Dog” vestibular disease, IVD is an inflammation of the nerve going between the inner ear and the brain and is something that tends to strike older dogs (and cats). In most cases, there is no known cause (hence “idiopathic”), though it can sometimes be caused by an inner ear infection. It was that first one I hadn’t noticed, likely because it was dark in the room, but it explains the strange head movements I saw. Her eyes were trying to orient her body to a room that was spinning rapidly around her. My dog had vertigo. I’ve suffered from vertigo on occasion due to my hearing issues, but only for short periods. It’s intense. And it’s scary. But I know what’s going on when it happens. Dahlia didn’t. Her world had been turned upside down and ours with it. But the good news is that while these episodes come on quickly, they also resolve…well…fairly quickly. Generally, the nystagmus should disappear within 3-4 days and at that point, you should see marked (though not complete) improvement. I am, of course, the type of person who immediately went on the internet and looked up more information on the disease and tried to find progress reports for people’s dogs who had gone through this same thing. One thing I found was that a lot of people had had this happen to their dogs. One thing I didn’t find were very many progress reports. I felt a little bit like I was in the dark staggering about with my dog and hoping I was doing the right thing by her. So I thought I would document Dahlia’s progress here on Team Unruly. I will admit up front that it is a month out from her original diagnosis and she is much improved, so never fear there! My girl has a strong will! I won’t lie. The first week that Dahlia struggled through this disease was one of the hardest weeks of my life. We brought Dahlia home rather than leaving her at the vet’s for supportive care (which was an option and never feel bad if you take them up on it). They gave her some sub-q fluids, a shot of Cirenia (for nausea), and recommended 25mg of Meclizine (an over the counter medicine used for motion sickness) a day for the first few days. The hope was that she would feel a little less nauseous and therefore eat something while all of this was going on. That first morning when she came home she didn’t seem too bad. I remember being relieved that she wasn’t “as bad” as everyone else’s dogs I’d seen videos of. She walked into the backyard. She was wobbly, but she could walk. She even managed to find a place to do her business. And when we went inside, she ate some hamburger. I remember being so happy that this was such a mild case and expected her to be back to her old self in a short bit. But that’s not how the disease goes. And in Dahlia’s case, it worsened over the course of that first day. By that evening, she was at her lowest point. She could barely walk and when she did, she only walked in circles. She developed a dramatic head tilt (in fact, the whole front of her body looked tilted oddly). She couldn’t get down the stairs, so we had to carry her down to go outside. This was an absolute nightmare for Dahlia. And it is for many dogs with IVD. When the world is spinning, they orient themselves by having their feet firmly on the ground. Removing that ground made her panic. But she wouldn’t walk with a towel underneath her belly. And she was terrified to go down the stairs (and we were terrified she’d hurt herself if we let her try). So we had to carry her. She rolled in our arms. We came close to dropping her a few times as she panicked. But we got her outside each time and she was, thankfully, able to find a place to pee on her own. Two days later, her eyes had slowed down, though there was still some movement, and that seemed to steady her a bit. She still couldn’t take the stairs to the outside and it was still an ordeal to get her out, but she wanted to go further once outside. Instead of just finding a spot to pee out front, she would get about two houses down and around the corner before laying down in exhaustion. Then we’d walk her back and carry her back inside. Because our house is two stories and our bedroom is upstairs, I ended up sleeping on the couch in the living room with her on the floor near me. I didn’t sleep well those first nights. I was constantly on alert, woke up at every little movement. Dahlia, thankfully slept through the night. Or at least, she did for the first two nights. At this point, she ended up with diarrhea, likely from all the stress (maybe from the medication), which just added to the difficulty. This was really the lowest point for us. I was exhausted and stressed out, afraid to sleep for fear she’d have another accident or try to get out or that she was overly stressed. It almost seems like a blur a few weeks out from it, like it happened in another lifetime. Day 4 was when we finally turned a corner. Her eyes stopped moving and while they still seemed a little glassy and she was definitely not “herself,” she was fighting to get back to normal. She pulled her “stubborn Dahlia” trick of standing there and refusing to move unless I went the way she wanted to go. We walked around the whole block. And that afternoon she insisted on going down the steps to the outside on her own. I held onto her collar and stayed with her in case she slipped. And she did stumble a little, but she made it down the steps without having to be carried down and when we returned, she made it back up the steps with only my hand on her collar. Which was simply massive progress at this point. It meant that there was less stress on her and one person could get her out. 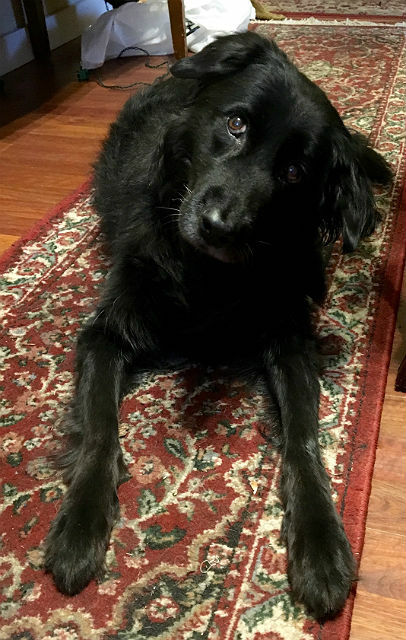 We also put down rugs all over the house because she wanted to move around more, wanted to visit us in the dining room or beg for scraps in the kitchen. We found all our old rugs and covered our hardwood floors with them. It seems like such a small thing, really. Getting down the stairs on her own. Walking around the house. Things she’s done every day of her life. But this was what we were down to: celebrating those little tiny moments. We had more to celebrate in the coming days. On the fifth day, her eyes lost the glassy look. She was more alert and with that came better balance. She walked further, she was interested in meeting other dogs and people, she squatted and peed with one leg in the air (see: the tiny moments!). She was able to control her speed better. The first few days of this consisted of walks where she would lurch forward, lose her balance, stagger, stop, and then lurch forward again. Day 5 showed a dog who could control her walking speed again. It meant the walks were slow, but she was able to stay walking at a steady pace. On the sixth day, she went for a mile-long walk. We’ve always allowed her to make choices for walks and that was her choice that morning. I was at work all day and when I arrived home, Dahlia was at the door to greet me. She had not had the energy or interest in getting up to go to the door since the whole thing began so having her there meant so much. The seventh day began with a vet trip to take care of the diarrhea issue as it wasn’t clearing up on its own, despite trying a bland diet. She wasn’t able to get into the car, so we had to walk her to the car and lift her in, which continued to be very difficult for her. She panicked and rolled and it took a few times to get her in and out. But the vet visit itself was good. They pronounced her in excellent health. She’d lost weight (thanks Ben!) and the vet said except for the head tilte and her being a little wobbly, there was nothing wrong with her. We got antibiotics and were on our way. We noticed some more small changes around the house that day. She was willing to walk into the kitchen, which is a tile floor. She contemplated going down the steps into David’s study but for some reason they made her nervous, so she stood at the top and watched from there instead. And she was less hesitant getting around the house. Her head tilt was still rather pronounced, but we noticed that while it was quite dramatic inside still, outside her head tilt was getting better. This is something many have noticed in the community that I belong to for dogs with this particular disease. Some will struggle more inside, some more outside, but it’s not unusual to find that your dog seems much better in one place, but still struggles in a different place. So at the end of that first week, things were better, but certainly nowhere near normal. I was still sleeping downstairs, still on the couch because she didn’t feel comfortable in the more enclosed guest room, and she still had a long way to go. But Dahlia has a strong will and she was working her way back to normal.